In congress, Senator (and renowned poet) Pablo Neruda (Gnecco) accuses the government of betraying the Communist Party and is swiftly impeached by the president. Police Prefect Oscar Peluchonneau (Bernal) is assigned to arrest the poet. In Europe, the legend of the poet hounded by the policeman grows, and artists led by Pablo Picasso clamor for Neruda's freedom. 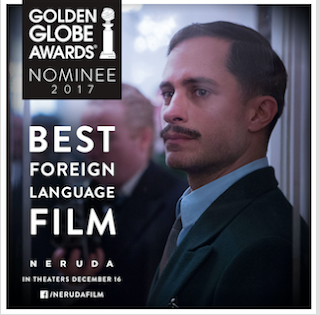 Neruda sees this struggle with his nemesis Peluchonneau as an opportunity to reinvent himself and he sets about playing games with the inspector, leaving clues designed to make their conflict more dangerous and more intimate.